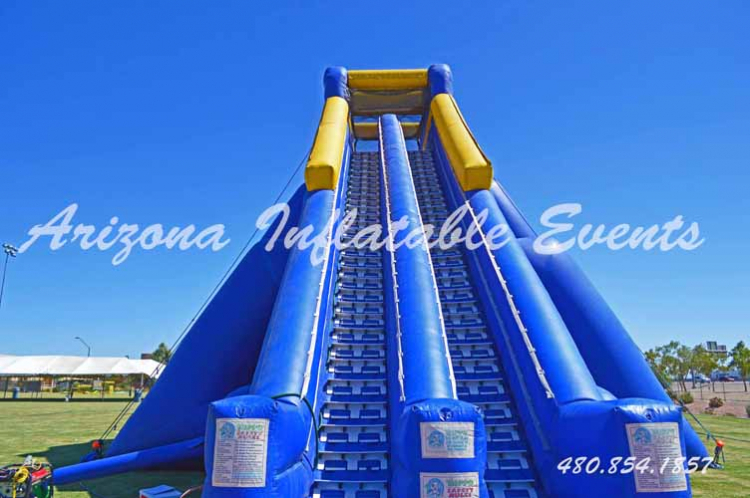 Arizona Inflatable Events is proud to offer one of the LARGEST Inflatable Water Slides. 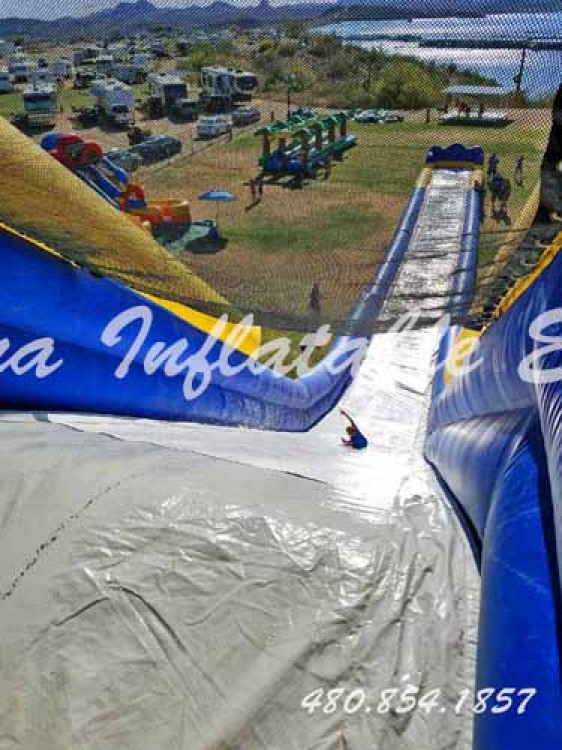 The Inflatable Hippo Slide is 4 stories tall and is the longest inflatable water slide rental at 175 feet. The Hippo Slide features easy climb stairs that are user-friendly and are designed for all ages. Each stair has easy grip hand holders and non-slip groves for a safe and easy climb to the top of this huge slide rental. 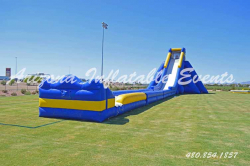 Once at the top of the inflatable slide there is only one thing left to do, have fun! 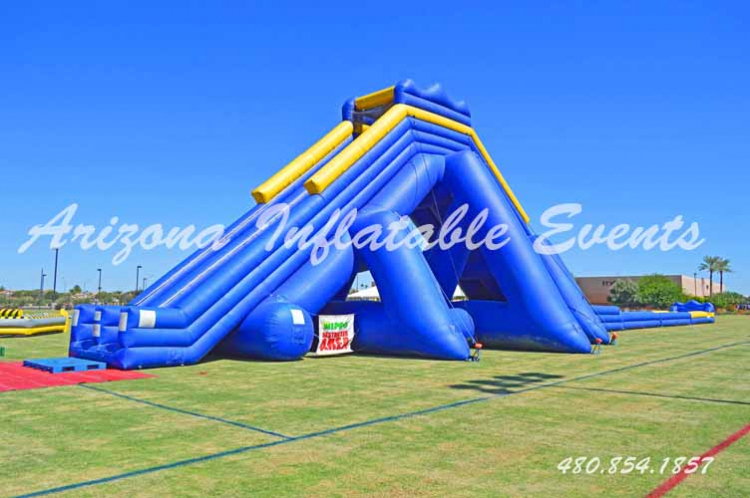 The Inflatable Hippo slide rental requires the ability to drive up to the area for set up and tear down. If you are not sure why we require the ability to drive in just keep in mind this slide weighs over 3900 pounds! A standard water source is also required. The Hippo Water Slide Rental includes two trained operators. One operator is at the entrance of the inflatable slide and sprays everyone’s feet to help keep the slide clean and controls access to the slide. The other operator is posted at the top of the inflatable slide and directs riders down the slide, monitors the traffic, and keeps the slide surface wet at all times. A third operator may be required for larger events to assist riders off the slide quickly and safely. The Hippo Slide is a sit-down, feet-first ride only slide. Jumping, flips or head first sliding is strictly prohibited and could result in the rider being immediately removed from the slide. Safety is our number one concern! Want to add a little more fun to this already amazing inflatable slide rental? Try adding a foam machine rental. As your guest come sliding down the slide and through the foam you will get nothing but smiles!